OVER $5,400 was raised at our Gravenhurst Rotary Giant Garage Sale on July 5th and 6th. 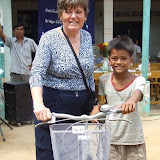 The funds raised will go towards Rotary Wheels for Learning bicycles for Cambodian Children who need a way to get to school. Many thanks to everyone who donated and volunteered. A special thanks to the Gravenhurst Curling Club for accommodating our sale and to Patrick Bongers for donating a huge garbage container. We have only 9 spots open for our next 3-week bicycle distribution trip to Cambodia – January 27th-February 17th – Open to all Rotarians and Friends – deadline to register is September 1st – don’t miss out on this rewarding adventure that will help so many children. Approx. trip cost (per person sharing): US$2,500. Email: rotarywheelsforlearning@gmail.com for trip details. It's my pleasure to come here and read such a blog for a noble cause. The idea of granting fund that will help Cambodian children to get to school is remarkable. You can go for proven solution for managing your grant program by omniCONTESTS. Brampton Rotary Clubs Donate $1,000 ! Thanks to Stephanie for Help with our Graphics! Orphan Rath and His Rotary Bike! Brennan Norman and Jack Lorenz Raise over $100 at their Bake Sale! 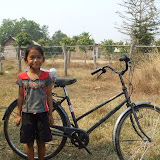 24 children of landmine survivors receive bikes! Children Line Up to Receive Rotary Bikes! 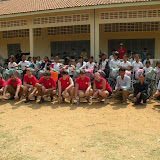 Donated by the Rotary Clubs of Orillia and Bracebridge-Muskoka Lakes to rural children in Kep, Cambodia. Lisa McCoy is a Rotarian from Gravenhurst, Ontario. She worked 23 years in the Public Library field. After having extensively traveled around the world, she decided to give worth and meaning to her travels by volunteering her efforts in aid of those less fortunate than herself; particularly the children and landmine survivors of Cambodia and the refugees of Burma. Lisa participated in disaster relief efforts in the aftermaths of the 2004 Boxing Day Tsunami, Cyclone Nargis on the Thai-Burma border and Typhoon Ketsana in Cambodia. She is the executive director of the Canadian non-profit organization ‘A Mine Free World Foundation’. In 2009, she spent 6 months in Cambodia where she attended the grand opening of The ‘Muskoka School’; a 6-room rural school funded by the citizens and Rotary Clubs of Muskoka. She is the Field Coordinator for Rotary Wheels for Learning - an international program of the Rotary Club of Gravenhurst, Ontario, Canada, District 7010. 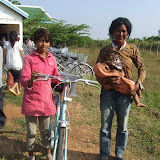 In the past 2 years, close to 2,000 bicycles have been distributed to needy students in Cambodia.